Sponsored: So you guys know I've been receiving a box of beauty treats from Pixi Beauty every month. Well this month, they sent me some products from their HOLIDAY COLLECTION! Let me tell you, it is fabulous and they knocked it out the park with this collection! I am so impressed. Let's get started! I LOVE LOVE ... ABSOLUTELY LOVE THIS! Sometimes you want a little sparkle on the inner corner of your eye. Sometimes you want to line your eye with a little sparkle. Well SAY HELLO TO SPARKLE IN PEN FORM! It's creamy. It's highly pigmented. This is the color OPAL! If you love Becca's OPAL, you will love this! These come in a fabulous array of colors. I will be investing in more of these. If you love red lipstick, you will love this one! I love red lipstick. I was kind of scared when I saw the words MATTE...eek! But this lipstick is fab :D Beautiful red color and it gives off the healthiest of shine to your lips. These are available in 10 beautiful colors. And last but not least, I received Pixi's new Palette Rosette. My palette must have had some problems via the mail service, because as you can see the All Over Glow was shattered :( I wanted to cry! LOL BUT I gathered everything back together again :) This palette contains everything you will need to do your entire face. What really impressed me was the day lid/night lid. Do you see that night lid color? It is GORGEOUS! It's like a plum raisin shade. It's beautiful. As you can see everything is pigmented and it's all about the GLOW. Pixi Beauty did an excellent job with all of these for the price point. I think these would make amazing gifts for you or someone you love. According to statistics, many engagements take place towards the end of the year. If you’re planning on popping the question this festive season, here are three tips for getting the best deal on an engagement ring. Before you go into a store, make sure you are armed with as much information as possible so you can pick a high-quality coloured diamonds with confidence. Jargon can get daunting, but armed with the right knowledge, you will be able to pick out a few options you want to see and then head off to the shops. Even if you decide to buy the engagement ring online, head to a store first to look at the kind of diamond you want and decide whether or not it lives up to your expectations. If you have any questions, ask online. You can research what other people found and for how much and how they decided on a diamond ring. No doubt you have heard all about the 4 C’s when it comes to choosing from a beautiful selection of engagement rings. But there are two just-as-important C’s to consider: cost and certification. Cost – Make sure you create a budget and stick with it. Try not to get emotionally attached to one particular ring and never rush the decision process. Take your time; do your research; and you will ensure you get the best value for your budget. Certification – The most popular gems are those that are certified by Gemmological Institute of America or even the American Gem Society Laboratories. A certificate with your ring guarantees the 4Cs of the diamond and will list any other defining characteristics such as polish and dimensions. While certified diamonds may cost slightly more, it does help you not to get scammed when buying a diamond engagement ring. You should also avoid internal certifications done in-house by jewellers – they really don’t mean much at all! 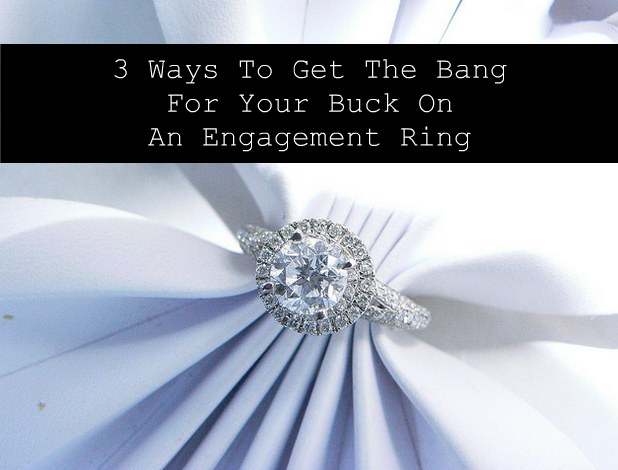 Before you go shopping for a dreamy engagement ring, talk to your partner about what they value and what they really like in a diamond without giving away too much of the surprise, if you can. These days, many couples prefer to go ring shopping together, especially if the woman is particular about her tastes. However, there are those who prefer the element of surprise and sparkles, in which case, you will need to discover what she likes, what will work for her, and then set your budget. Another idea is to pick out a simple setting with a simple solitaire diamond to propose with. Then, once she has accepted, you can take her shopping and switch out the setting to something she absolutely loves. No matter which route you choose to go, there are plenty of ways to get the best deal and save money without having to settle for inferior quality for a diamond engagement ring. This post was contributed by Mediabuzzer.